Decorate your garden, tout your heirloom pride, and nurture your inner gourmet: grow purple beans. When purple beans blossom, their flowers are a lovely shade of lilac. The stems are purple; the green leaves are edged in purple, too. And boy, do these babies grow. They handily out-grew our Blue Lake Beans (a classic, tender green variety), and beat the Blue Lakes to the top of the fencing — and then, just to be sure that their victory would remain uncontested, they out-grew the fencing, too, waving several feet of vine in the air and in some cases growing back down the fence. Amazingly fast grower; quicker to mature than some green beans. Hardy: tolerant of clay soil; not finicky about water; and grows too quickly for the bugs to take over! Beautiful at all stages of growing: tinged purple leaves and stems, lilac flowers, deep purple beans. 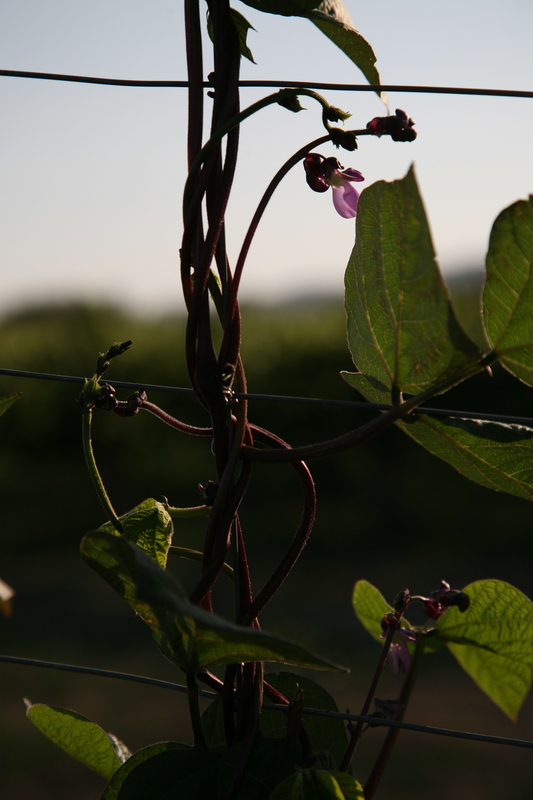 Fast-growing, hardy, beautiful, and somehow gourmet because they’re purple, these beans are tough to beat! I give Dow Purple Podded Snap two thumbs way, way up.